Scientists, futurists, and science fiction writers have been talking about it for over a century, and fans of science fiction and futurists have fantasized about it for just as long. The portable directed-energy weapon that zaps your enemies, rendering them incapacitated or reducing them to a pile of ashes! The concept has gone through many iterations over the decades, ranging from laser pistols and cannons to phasers. And yet, this staple of science fiction is largely based in science fact. Since the early 20th century, scientists have sought to develop a working directed-energy weapon, based on ideas put forward by many inventors and scientists. A”death ray” is a theoretical particle beam or electromagnetic weapon that was originally proposed independently during the 1920s and 30s by multiple scientists. From these initial proposals, research into energy-based weapons has been ongoing. While most examples come predominantly from science fiction, several applications and proposals have been produced during the latter half of the 20th century. During the early 20th century, many scientists claimed that they had created a working death ray. For instance, in September of 1924, British inventor Harry Grindell-Matthews attempted to sell what he reported to be a death ray that could destroy human life and bring down planes at a distance to the British Air Ministry. While he was never able to produce a functioning model or demonstrate it to the military, news of this prompted American inventor Edwin R. Scott to claim that he was the first to develop a death ray. According to Scott, he had done so in 1923, which was the result of the nine years he spent as a student and protege of Charles P. Steinmetz – a German-American professor at Union College, New York. In 1934, Spanish inventor Antonion Longoria claimed to have invented a death ray machine which he had tested on pigeons at a distance of about 6.5 km (4 miles). He also claimed to have killed mice that were enclosed in a thick-walled metal chamber. However, it was famed inventor and electrical engineer Nikola Tesla who provided the most detailed framework for such a device. In a 1934 interview with Time Magazine, Tesla explained the concept of a “teleforce” (or directed energy) weapon which would be capable of destroying entire squadrons of airplanes or an entire army at a distance of 400 km (250 miles). Based on his descriptions, the device would constitute a large tower that could be mounted on top of a building, positioned either next to shores or near crucial infrastructure. This weapon, he claimed, would be defensive in nature, in that it would make any nation employing it impregnable to attack from air, land or sea, and up to a distance of 322 km (200 miles). During World War II, multiple efforts were mounted by the Axis powers to create so-called “death rays”. For instance, Imperial Japan developed a concept they called “Ku-Go”, which sought to use microwaves created in a large magnetron as a weapon. Dresden, 1945, view from the city hall (Rathaus) over the destroyed city. Credit: Wikipedia Commons/ Deutsche Fotothek? Meanwhile, the Nazis mounted two projects, one which was led by the researcher known as Schiebold that involved a particle accelerator and beryllium rods. The second, led by Dr. Rolf Wideroe, was developed at the Dresden Plasma Physics Laboratory until it was bombed in Feb. 1945. In April of that year, as the war was coming to close, the device was taken into custody by the US Army. On January 7th, 1943, engineer and inventor Nikola Tesla died in his room at the Hotel New Yorker in Manhattan. A story quickly developed that within his room, Tesla had scientific paper in his possession that provided the most detailed description yet for a death ray. These documents, it was claimed, had been seized by the US military, who wanted them for the sake of the war effort. Ray guns, and other examples of directed-energy weapons have been a common feature in science fiction for over a century. One of the first known examples comes from H.G. 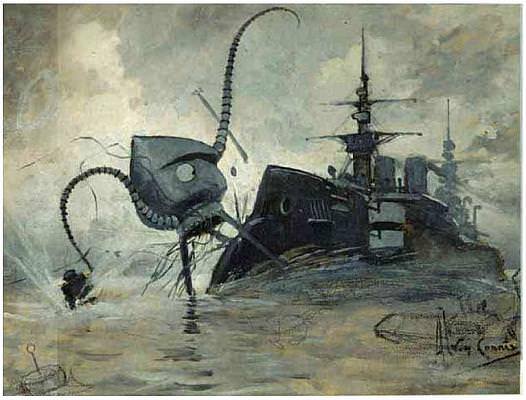 Wells seminal book, War of the Worlds, which featured Martian war machines that used “heat rays”. However, the first use of the term was in The Messiah of the Cylinder (1917), by Victor Rousseau Emanuel. Ray guns were also a regular feature in comic books like Buck Rogers (first published in 1928) and Flash Gordon, published in 1934. In Alfred Noyes’ 1940 novel The Last Man (released as No Other Man in the US), a death ray developed by a German scientist named Mardok is unleashed in a global war and almost wipes out the human race. The concept of the blaster was introduced by Isaac Asimov’s The Foundation Series, which were described as nuclear-powered handheld weapons that fired energetic particles. In Frank Herbert’s Dune series, energy weapons take the form of continuous-wave laser projectors (lasguns), which are rendered obsolete by the invention of “Holtzman shields”. According to Herbert, the interaction of a lasgun blast and this force field results in a nuclear explosion which typically kills both the gunner and the target. Further examples of death rays can be found in just about any science fiction franchise, ranging from phasers (Star Trek) and laser blasters (Star Wars) to spaceship-mounted beam cannons. In terms of real-world applications, many attempts have been made to create directed-energy weapons for offensive and defensive purposes. For instance, the development of radar before World War II was the result of attempts to find applications for directed electromagnetic energy (in this case, radio waves). In the 1980s, U.S. President Ronald Reagan proposed the Strategic Defense Initiative (SDI) program (nicknamed “Star Wars”). It suggested that lasers, perhaps space-based X-ray lasers, could destroy ICBMs in flight. During the Iraq War, electromagnetic weapons, including high power microwaves were used by the U.S. military to disrupt and destroy the Iraqi electronic systems. On March 18th, 2009 Northrop Grumman announced that its engineers in Redondo Beach had successfully built and tested an electric laser capable of producing a 100-kilowatt ray of light, powerful enough to destroy cruise missiles, artillery, rockets and mortar rounds. And on July 19th, 2010, an anti-aircraft laser was unveiled at the Farnborough Airshow, described as the “Laser Close-In Weapon System”. In 2014, the US Navy made headlines when they unveiled their AN/SEQ-3 Laser Weapon System (or XN-1 LaWS), a directed-energy weapon designed for use on military vessels. Ostensibly, the purpose of the weapon is defensive, designed to either blind enemy sensors (when set to low-intensity) or shoot down unmanned aerial vehicles (UAVs) when set to high-intensity. Then is what is known as “Active Denial Systems”, which use a microwave source to heat up the water in the target’s skin, thus causing physical pain. Currently, this concept is being developed by the US Air Force Research Laboratory and Raytheon – a US defense contractor – as a means of riot-control. A Dazzler is another type of directed-energy weapon, one which uses infrared or visible light to temporarily blind an enemy. Targets can include human beings, or their sensors (particularly in the infrared band). The emitters are usually lasers (hence the term “laser dazzler”) and can be portable or mounted on the outside of vehicles (as with the Russian T-80 and T-90 tank). An example of the former is the Personnel Halting And Stimulation Response rifle (PHASR), a prototype non-lethal laser dazzler being developed by the US Air Force Research Laboratory’s Directed Energy Directorate. Its purpose is give infantry or other military personnel the ability to temporarily disorient and blind a target without causing permanent damage. Blinding laser weapons were banned by treated under the UN Protocol on Blinding Laser Weapons, which was passed in 1995. However, the terms of this protocol do not apply to directed-energy weapons that inflict only temporary blindness. We’ve come a long way since the term “raygun” became a household name. At this rate, who knows what the future will hold? Will Tesla’s dream of a Death Ray ever come true? Will we see directed-energy satellites put in orbit, or handheld lasers becoming the mainstay of armed forces and space explorers? Hard to say. All we can be sure of is that the truth will likely be stranger than the fiction! We have written many articles about the directed-energy and lasers for Universe Today. Here’s Telescope’s Laser Pointer Clarifies Blurry Skies, The Challenges of Lasers in Space, Don’t Want Aliens Dropping By? Engage Laser-Cloaking Device, Could a “Death Star” Really Destroy a Planet?, and Finding Aliens May be even Easier than Previously Thought. If you’d like more info on the Death Ray, check out this article from Rense.com. We’ve also recorded an entire episode of Astronomy Cast all about the Death Ray. Listen here, Episode 36: Gamma Ray Bursts.